Hello my friends, I know it’s been a while, but t’is truly the season. Meaning, this is THE season for quilters to be busy. June is second to the holiday season for reason of graduation gifts. But a far second, let me tell you. 1. DO THEY USE A STABILIZER ON THE SHIRTS? Stabilizer is a light fabric that is ironed onto the backside of any jersey knit item to stop it from stretching. If you have shirts that are in good shape, or relatively new, this may seem like something that could be skipped. Not so, my friends. When the shirts are sewn together, the stabilization prevents the shirts from stretching at the seam, so you don’t get your quilt back with all sorts of puckers at the seams. 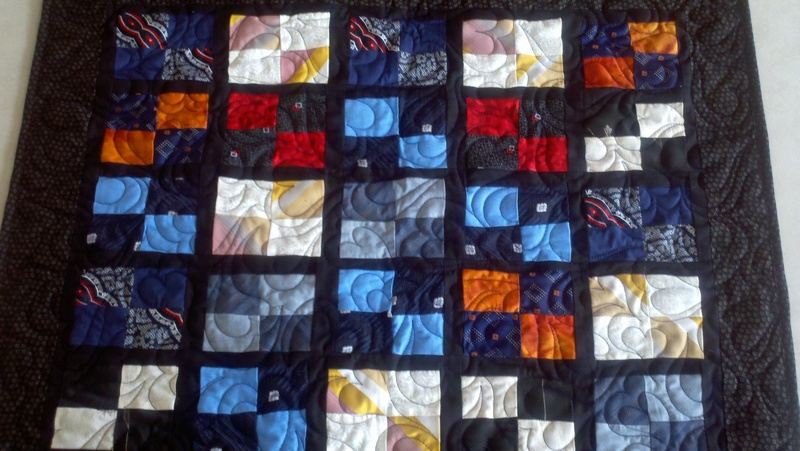 When the quilt is quilted, the stabilizer also adds an extra layer of strength and thickness to the top and ensures no puckers end up within the quilting. 2. WHAT KIND OF BATTING WILL BE USED? Batting is the center, and batting price and quality varies more than cotton fabric. 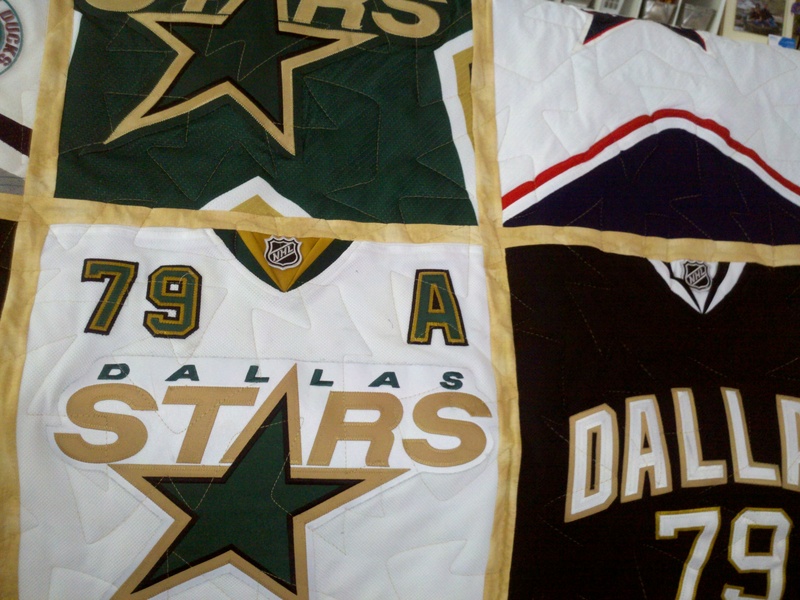 If they tell you they use 100% polyester, your quilt will not be as warm, and may disintegrate after time and washing. 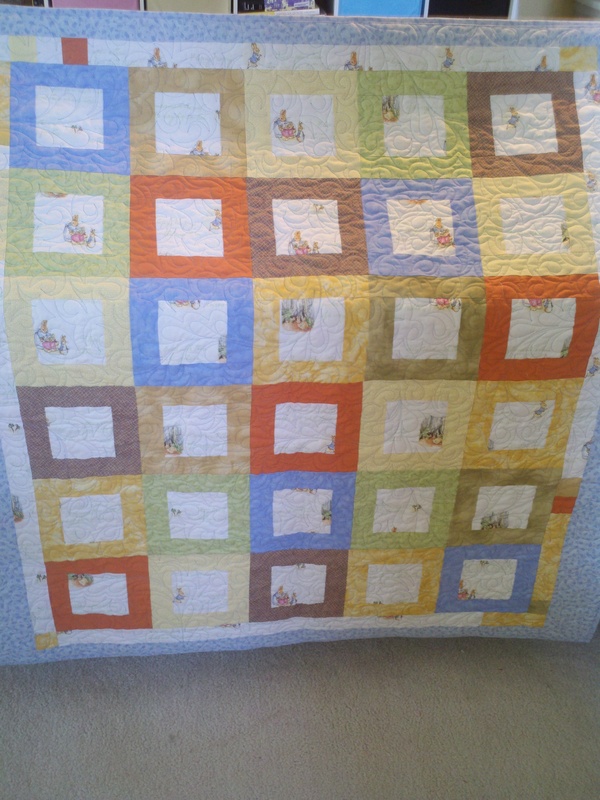 80/20 batting is a blend and works great for this application, and cotton will quilt nicely, and lay flat. 3. HOW MUCH QUILTING WILL BE DONE? 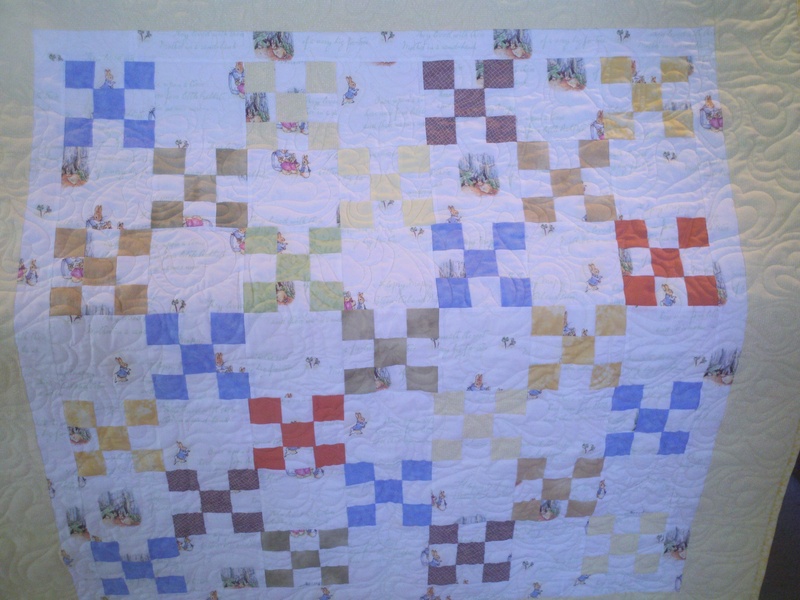 The point of the quilting is to relieve tension on the seams and threads throughout the quilt. 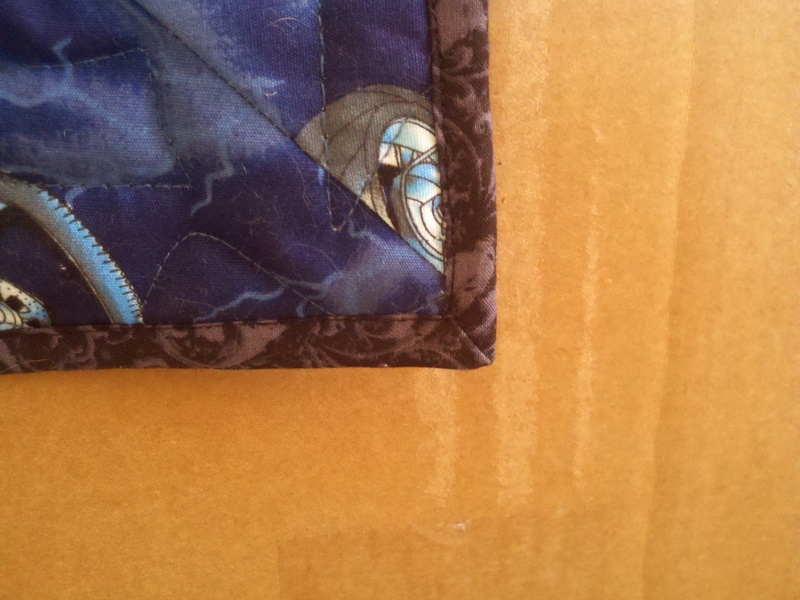 Less quilting = more stress on those seams, which means they will come apart sooner. Batting requires stitching or ties to hold it EVERY 4-6 square inches, (unless bamboo batting is used). So if your quilter says s/he will be quilting it every 12″, your batting will eventually tear and shift. Not good. 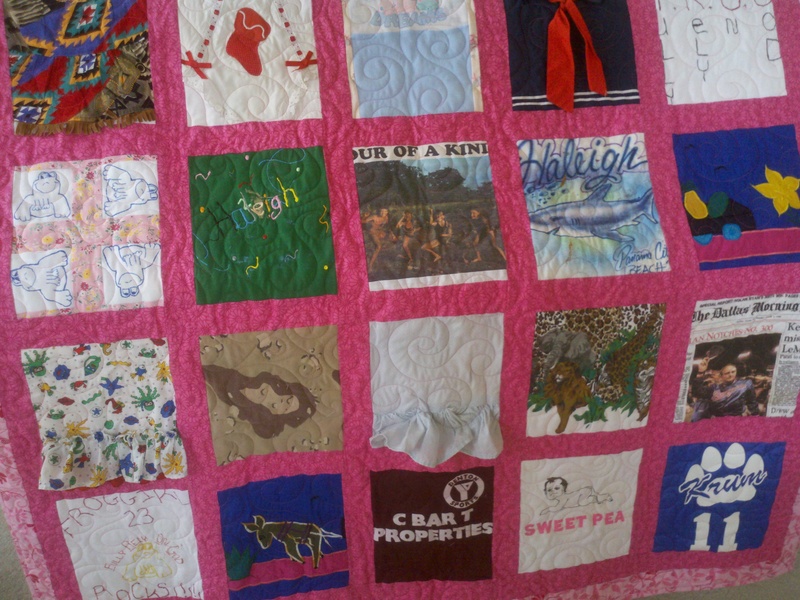 Don’t pay someone to make your treasures into a quilt that will not last past a few washings. 4. 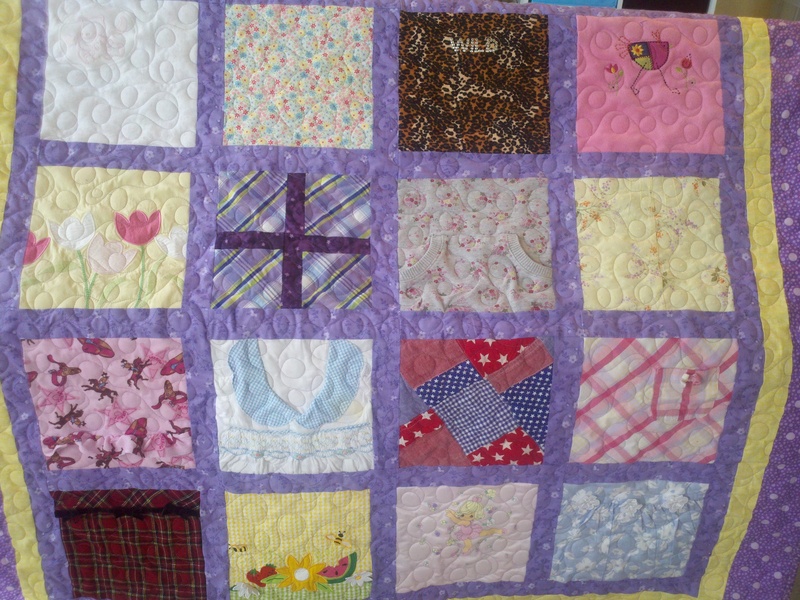 WILL THERE BE ANY MATERIAL THE QUILTER PROVIDES? There are a few reasons to ask this question. One, if they are providing material for you, you will want to know the quality of the fabric (i.e. where did they buy it – a quilt shop or a cheaper craft store), the constitution (is it 100% cotton), and whether it has been prewashed. Secondly, you want to know that they are using good quality if that is what you are paying for. If the charge passed on to you per yard is <$10 you can bet it’s not fabric from a quilt shop, so you may have rougher texture, lower thread count, shredding seams or color bleed in the end. 5. 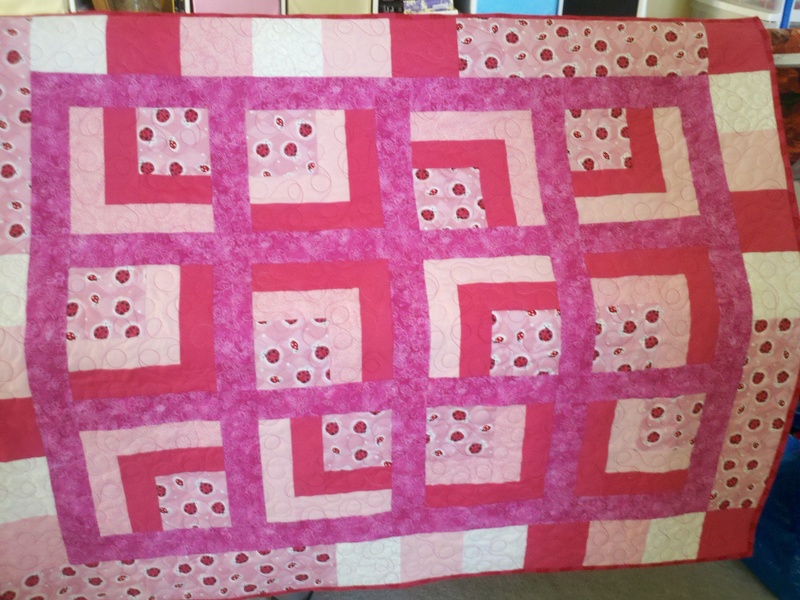 HOW DO THEY FINISH THE QUILT EDGE? In my world, we call this the binding. There are several types, the above example is called double or French fold, applied binding. It is a good, sturdy, even and neat type of binding. Self-applied binding is when the back edge is folded over to the front, and if machine stitched, will provide a sturdy finish but softer edge. Envelope bind is when the edges are folded in and top stitched by machine. This is the toughest way to make a binding edge neat and even, so be sure to ask for photos of their work in advance. I implore you to ask ask ASK for details from the maker PRIOR to relinquishing your shirts. 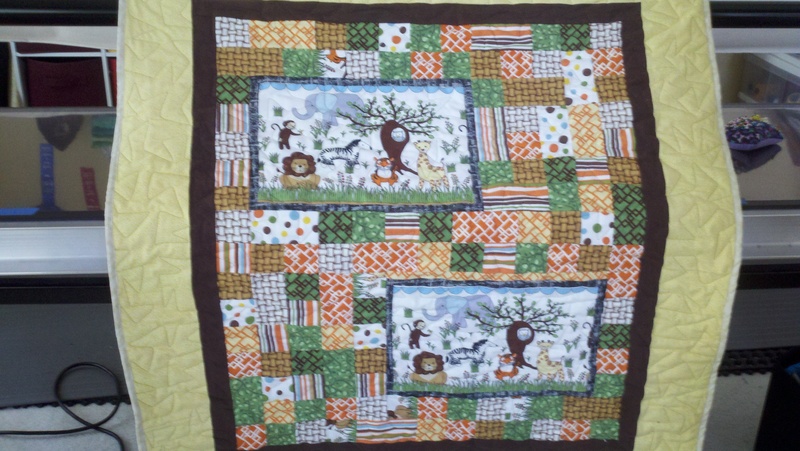 It makes me very sad that there are great quilt makers out there potentially having their reputation tarnished by the few that are either ignorant or not focused on the quality and care of your special item. These are truly one of a kind gifts and should be treated as such. 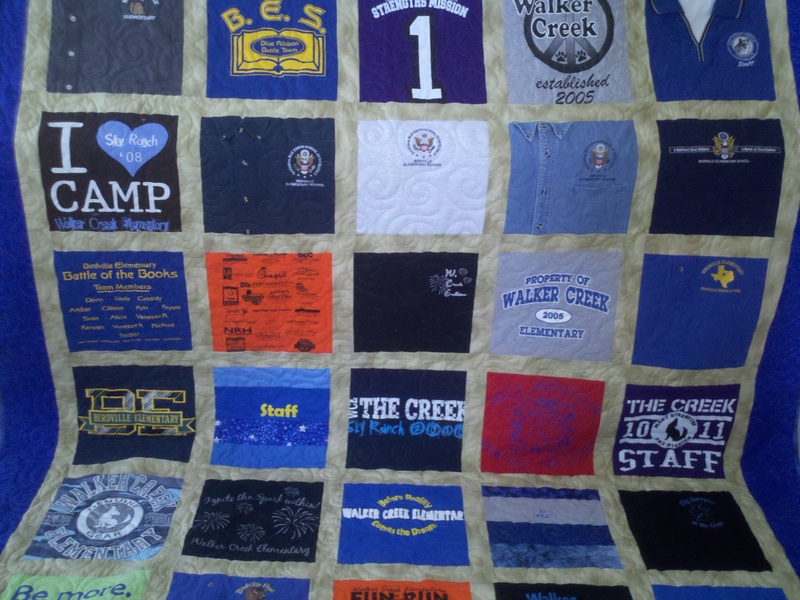 I’ve made enough memory quilts to truly appreciate these irreplaceable gems and what they mean to the families that retain them. I can tell you that you will definitely get what you pay for. 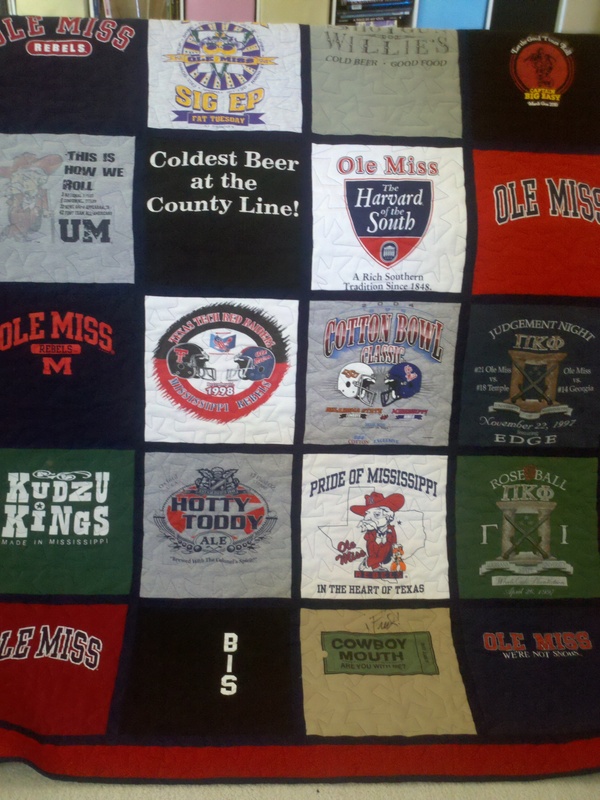 Experienced and knowledgeable quilt makers will charge you for the materials and labor, and that adds up to a lot more than a Walmart or Cracker Barrel quilt, so don’t expect to pay those prices. If you ask for a breakdown of costs, most quilters will provide one. Or ask why they charge more than another quilt maker, and they will be able to detail the various benefits you will get from the quality they can offer. Buyer beware, and best of luck with your endeavor my friends!! Let me start by saying that my baby is 10, and my other baby is 14. I’m still working off the baby fat, but I’m ok with that. We all have our own timelines for these things. 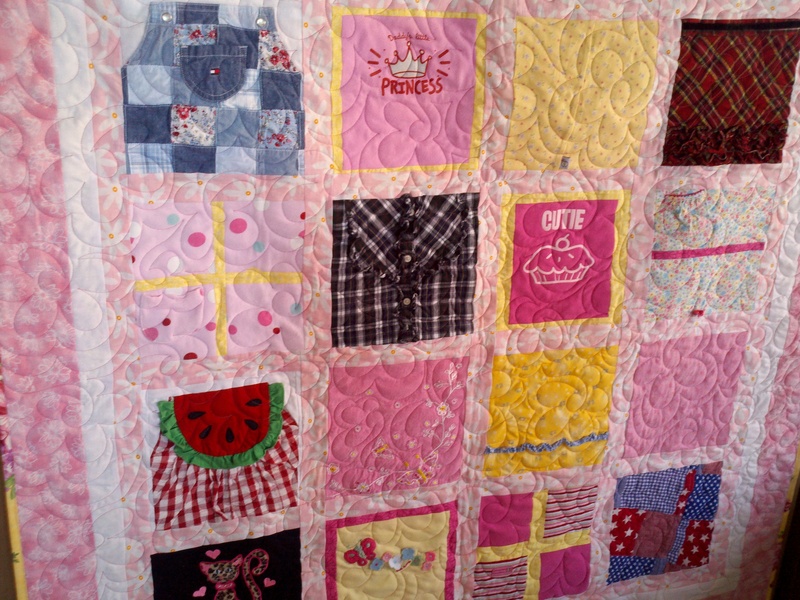 Regardless of the absolute concrete rock-solid plan to have no more diapers grace this loving household (unless Kaela is babysitting…), baby quilts are one of my FAVORITE projects to complete! Secondly, THEY ARE SMALL. This means the amount of work to complete one is exponentially less than completing a large bed quilt. Trust me on this one. Third, they usually come as a result of celebrating a special event = an addition to the clan. Now there are drawbacks. Minky, ultra-soft, fleece, whatever soft cuddly fabric you choose, it is A ROYAL pain to work with. 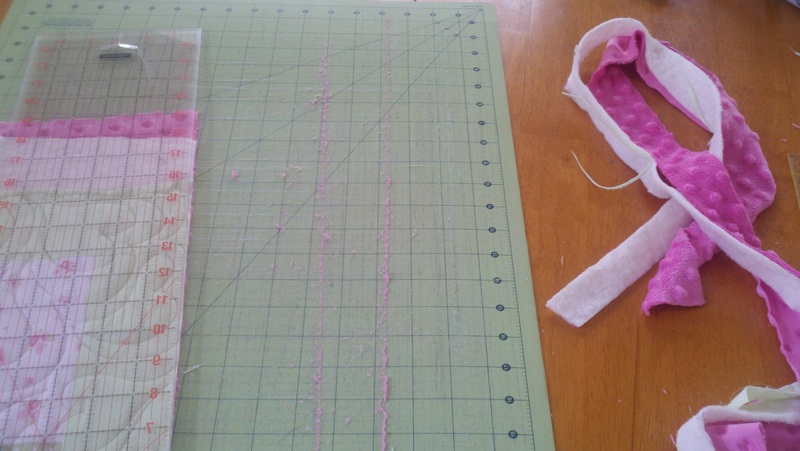 That stuff shifts, stretches, waffles… I swear I could do without the fallout from cutting minky for eternity. And trying to get it out of your cutting mat is like trying to get the spaghetti sauce stain out of a tupperware dish after it’s microwaved to the boiling point. I call it: permaminky. 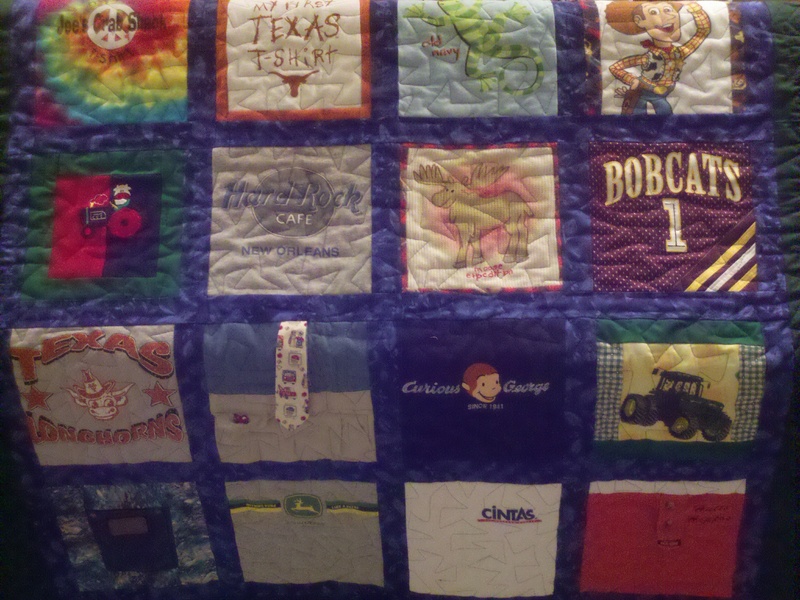 I quilted it with a triangular meander, which is pretty boyish and went along with the angles in some of the fabric. I found this fabric as a sample pack from a vendor and matched the back, which all worked out to be in his room colors! No pattern used, which made it pretty exciting; I just figured I would use the panels as a start and make squares and rectangles to fit around them. I added borders to enlarge it a bit and voila! 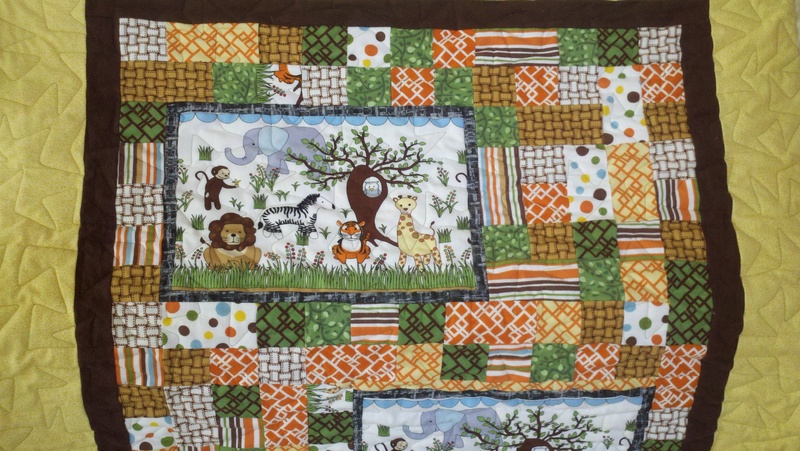 Unfortunately not all quilts are destined to grace a new baby’s crib. The one below was made in memorial to the mother, for this Mother’s Day. 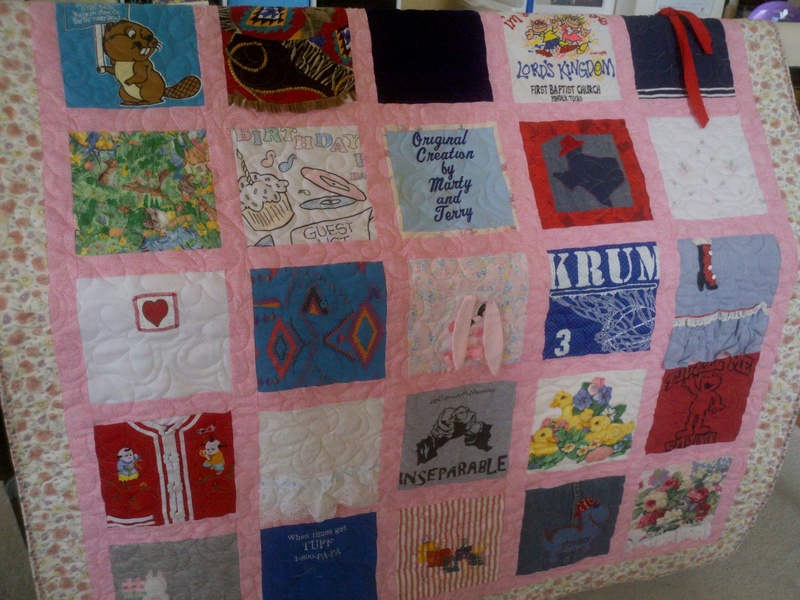 It is a gift from her wonderful circle of family and friends, as are the materials included in the quilt. A special onesie is embroidered on the front with her name and birthdate and a label on the back in homage to her support group. It is sad to share, but it will always serve as a beautiful reminder to her of a member of her family awaiting her in heaven. I felt very special to be included in this project. 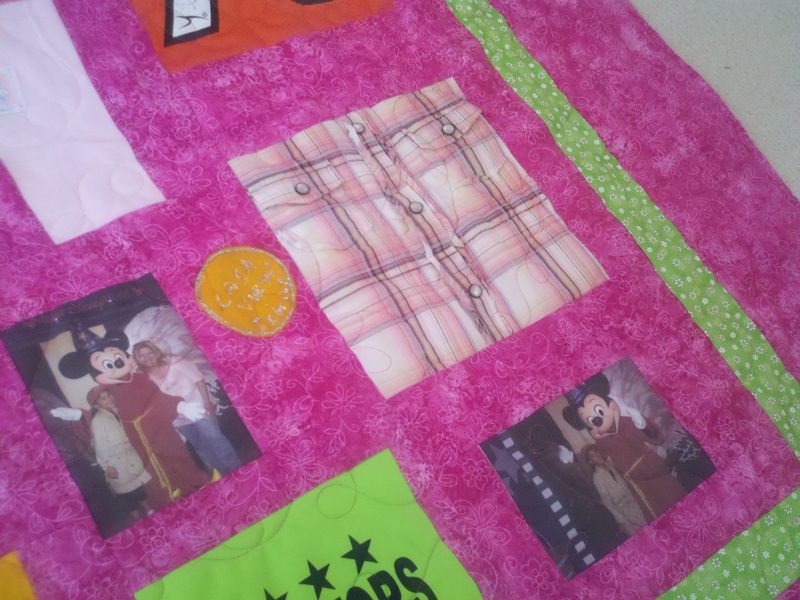 I quilted it with all over hearts, and I think it couldn’t have turned out better. I made this cutie just cuz… the center fabric was on clearance at the shop, so I used it as the main focus and matched all those border blocks to make a simple but sweet little quilt! 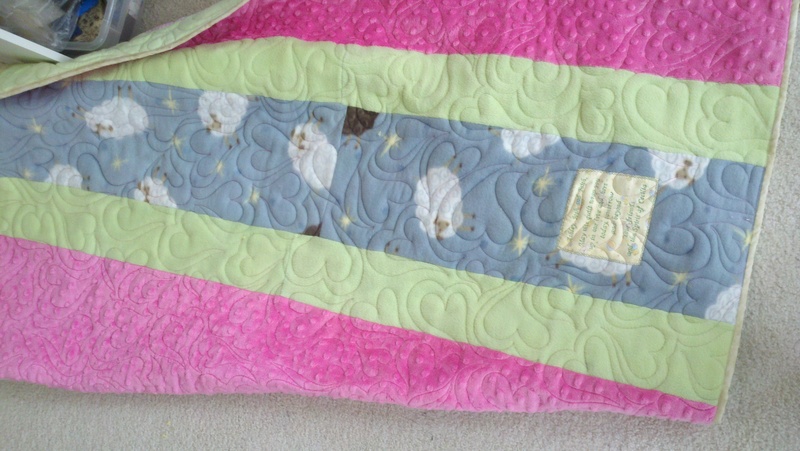 I quilted it in rainbow fans because they are in the fabric and, it just looks cute. These two I made at the same retreat mentioned above. I had left over Peter Rabbit fabric, so tried two different patterns to use it up. I like the 9 patch best, but they both went to good homes. 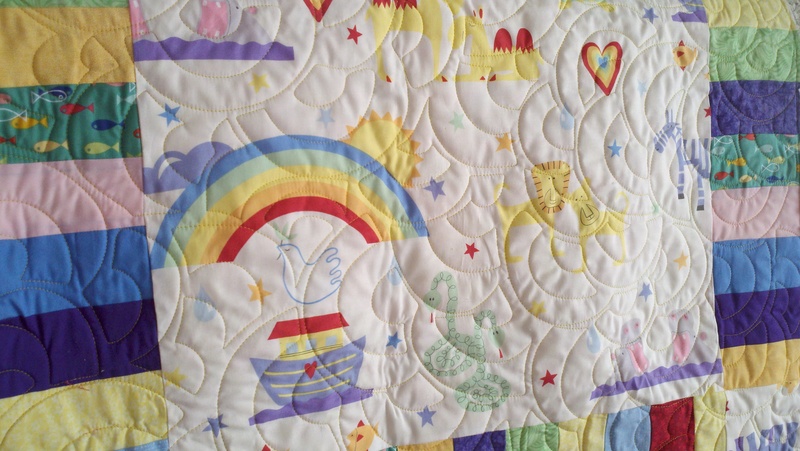 The blue bordered quilt was quilted in feathers and curls, and the nine patch (yellow border) has hearts all over it (which is the pattern of the yellow fabric). 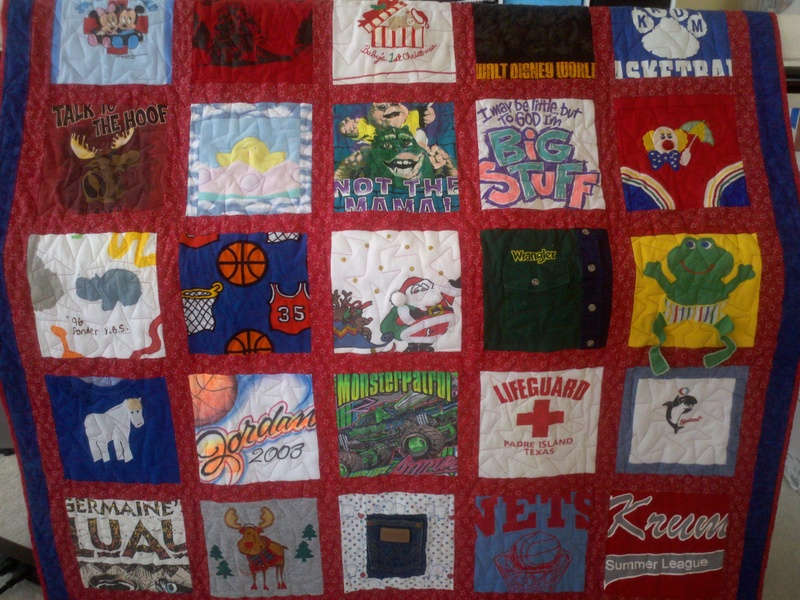 I have actually made MANY quilts like these, but the ones below are made from CHILDREN’S CLOTHING. They have more of a purpose, because the child has outgrown these clothes, sometimes 16 years ago (seriously). But I like to be involved in preserving someone’s memories in such a special fashion.